Join us for hands on restoration workdays and help to physically improve the health of the Chicago River. Workdays are led by Friends’ staff, partners and interns and may include activities such as removing non-native plants, collecting native seeds, monitoring projects, and more. 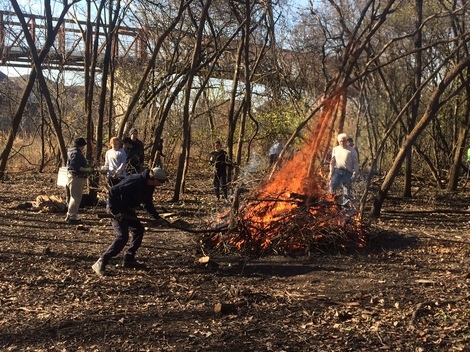 Centennial Volunteers is a partnership with the Forest Preserves of Cook County, Friends of the Forest Preserves, The Field Museum, and the Chicago Ornithological Society to provide numerous restoration opportunities at eight special river sites throughout the Chicago River system. It is great way to gain some training in restoration practices and become a part of a community of like-minded individuals who are not afraid to get dirty, get some exercise and have fun outside. There are workdays being held all the time, check out our events page for one near you. All you have to do is show up! Contact Annette Anderson for more information.